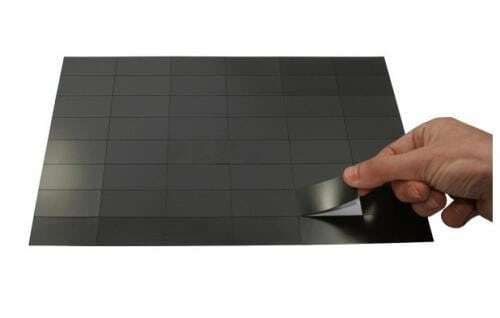 Pre-cut self adhesive magnetic patches – 40x20mm or 60x30mm. Turn your printed key messages into instant fridge magnets. Just peel off the backing sheet and press it on! An easy solution for almost anything you wish to display in the home or office. Magnets and Print Ltd are specialist manufacturers of self-adhesive magnetic patches. Our magnetic patches are produced from the highest quality magnetic material and have a high tack adhesive on the back. Just peel off the lining paper to expose the adhesive and then attach to your printed material. In the manufacturing process only the magnetic layer is cut so that the magnets remain in place on the backing paper. When the magnetic patch is peeled from the backing paper the tacky adhesive is exposed. Your business details and marketing material will be highly visible, thanks to the magnetic patch on the back. The magnetic patches are small and discreet making your postage easy and affordable. For quotes and questions please complete the below form. We will contact you within 24 hours.